Like most US states, South Carolina has elected some bad governors over the years. Pitchfork Ben Tillman, an avowed racist and demagogue who did a great deal to divide the state in the late 19th century, is currently getting some much-needed scrutiny, but one of his protegés, Cole Blease, never fails to amaze when his career is analyzed. Blease acquired such a bad reputation that he was said to represent the worst aspects of Jim Crow and Ben Tillman, a noxious combination if there ever was one. Blease, for example, is said to have once buried the severed finger of a lynched black man in the South Carolina gubernatorial garden in Columbia. He was not only doggedly political, but arrogant about it, as well. 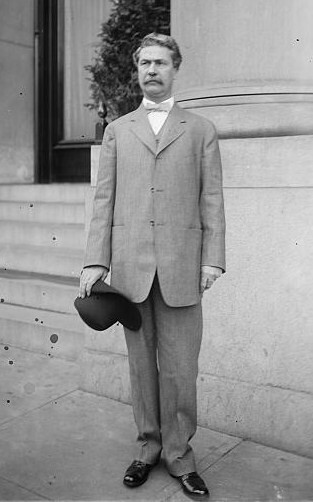 In early February 1911, less than a month after taking office, Blease stated publicly that he wouldn’t appoint anyone but friends to public office if he could help it. The matter came to a head after a judge elected in Richland County, where Columbia is located, did not qualify in time to take office immediately, and a short-term intermediary was needed. 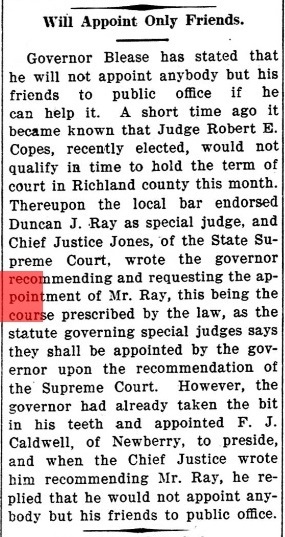 The Richland County Bar Association endorsed Duncan J. Ray as a special judge, and Ira B. Jones, chief justice the SC Supreme Court, wrote the governor recommending and requesting the appointment of Ray, adding that this was “the course prescribed by the law, as the statute governing special judges says they shall be appointed by the governor upon the recommendation of Supreme Court,” according to an article in the Feb. 9, 1911, edition of the Bamberg Herald. “However, the governor had already taken the bit in his teeth and appointed F.J. Caldwell, of Newberry, to preside, and when the Chief Justice wrote him recommending Mr. Ray, he replied that he would not appoint anybody but his friends to public office,” the paper added. Blease made no apologies for injecting politics directly into the judiciary system. The (Columbia) State newspaper, begun in 1891 as a response to Tillman and his politics, took Blease to task. “Mr. Blease was nominated for governor by a primary of the Democrats. He was elected governor, not by ‘his friends’ but by the Democrats of South Carolina, including his ‘enemies,’ or non-supporters in the primary, who accepted the result of the primary in good faith, who did not oppose him in the November election and who aided in his election by their votes,” the paper stated in an editorial. Bamberg Herald article from Feb. 9, 1911, detailing Gov. Cole Blease’s statement to appoint only friends to office whenever possible. Yes, Blease was never short on candor, even if he lacked prudence, common sense and compassion. In the same address, Blease urged the re-institution of public executions, particularly those of blacks. Jim Crow was, no doubt, a society wide effort, but its efficacy was driven by men like Blease and Tillman. Their legacy lives on in the cultural dysfunction we continue to experience today. One suspects something along the lines of white, anglo-saxon Protestant, and having been in the US at least 100 years previously. So once in the U.S. and not going in for any misalliances over the previous 100 years ‘Caucasian’ blood is pure…. The Haves have been dividing and exploiting the Have Nots for a long, long time. If Tillman were alive now, I’m sure the Republicans would nominate him for president. No, Tillman was far more vicious than, say, David Duke, who never got close to getting a presidential nomination, but he would likely garner some fringe votes. He could very likely get elected to any SC house or Senate seat that is north of I-20 and west of I-77. Is Donald Trump the reincarnation of Coleman Blease? The rhetoric and the race baiting “The Donald” delivered to the public is similar to both Tillman and Blease. Well, I don’t know that anything is similar to what Tillman and Blease used to shovel out for consumption, but that’s faint praise, given the venom the pair spewed on a regular basis. Trump, unfortunately, is playing the populist card, saying what a lot of people want to hear. I suppose that’s what Tillman and Blease did, as well. Sadly, you can usually do pretty well in politics playing to the lowest common denominator.